Reduce anxiety and increase appetite. • Ginkgo Biloba works by increasing memory capacity. • Honey as a tonic to improve health and stimulate the nervous system. • Centella asiatica (Gotu kola) works to improve the intelligence. 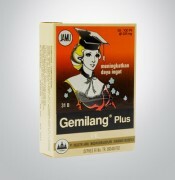 • Phaseolus vulgaris work to prevent dizziness. • Piper retrofractum to increase stamina.